Everyone who has been to Venice has looked out from the Piazzetta, the Doge’s Palace on the left and Sansovino’s magnificent library on the right, over the bevy of gondolas across the lagoon to Palladio’s San Giorgio Maggiore. It is marooned on an island – seemingly so near, but across a watery space, there it stands, solid and unmovable – but not its contents. Go inside, and the calm proportions enshrined in pale grey stone and off white walls, are dramatically disturbed by the huge Last Supper by Tintoretto dramatically tipping the figures along the diagonal table towards you. Go into the cool rectangle of the monks’ refectory and Veronese’s Marriage at Cana is at the far end above the prior’s high table. Or is it? The painting seems familiar, but strange. When I took students to Venice I became aware of Napoleon’s taste in art. Wherever he could, he stripped buildings of works by Veronese, the most jovial of the great Venetian painters in the 16th century, adding the Horses of St. Mark’s on his way. They, at least, thanks to Canova’s pleas at the end of the Napoleonic wars, were taken down from the railings round the Louvre and returned to where I first stroked them, above the portico to St. Mark’s – now they are there in fibreglass. It happened I was staying in the prior’s apartments that are now part of the cultural foundation that uses the former monastery next to San Giorgio. 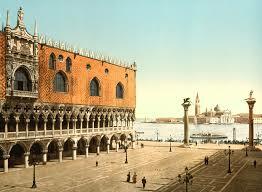 A copy of Veronese’s great work has been placed where the original once was. ‘An exact copy,’ I was told, ‘even down to where Napoleon’s soldiers cut it out. It had to be resewn.’ I thought it absurd to copy the desecration down to the actual stitching and not how it was originally painted in that space – and had a vision of Veronese marking out the groups in rough brown shapes, then painting at the top of a ladder, or more probably scaffolding, with assistants running up and down carrying the paints and paraphernalia he needed. Of the voices, buzz of excitement as the figures were painted into our space and imagination, our eyes relishing the tactile pleasure of the strokes of colour, and the cocktail of smells from the ingredients in this banquet of visual delight. I was there in the huge refectory with the directors of the foundation and the studio that has done this minutely accurate reproduction using the very latest scientific methods. They felt it was as if a masterpiece had returned to its original place. It was, again, in situ. ‘Why not give this to the Louvre,’ I said, ‘and ask for the original to be returned. It was war booty and belongs here.’ Both were horrified. ‘It’s exactly the same,’ said the one who had provided the exact copy – down to the tear and the stitches.